Now get designing! When you complete your game, you can submit it here. You have until midnight Hawaii time on August 26! 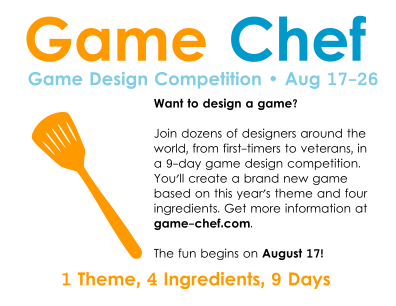 Game Chef 2018 will run from August 17th to 26th. The contest begins just after midnight New Zealand time on August 17th and ends just before midnight Hawaii time on August 26th, to give everyone the maximum amount of time to work on their games. If you’re excited about this year’s competition, follow our Google+ community, Facebook page, or Twitter to hear the announcement of this year’s theme and ingredients. This year we had 76 games submitted. The peer reviews on the games were exceptionally positive, and we congratulate all of our participants on their hard work in creating a game. We can’t wait to see what comes of all of the games from this year’s contest. The English-language winner will be announced on August 14. Game Chef 2017 will run from June 30 to July 10. The contest begins just after midnight New Zealand time on June 30 and ends just before midnight Hawaii time on July 10, to give everyone the maximum amount of time to work on their games. If you’re excited about this year’s competition, follow our Google+ community, Facebook page, or Twitter to hear the announcement of this year’s theme and ingredients.